by "Manufacture d'Armes Damon et cie, St Etienne" ? This model is not marked with any manufacturer's name, but other similar, although possibly earlier, examples of the "Nationale Rifle" have been reported as carrying the name of the maker shown in the heading. The next two images can be rotated and zoomed, either as initially loaded or full-screen for higher definition. Bolt locking is achieved by the rotation of the bolt handle rib down against the rear shoulder of the receiver bridge. 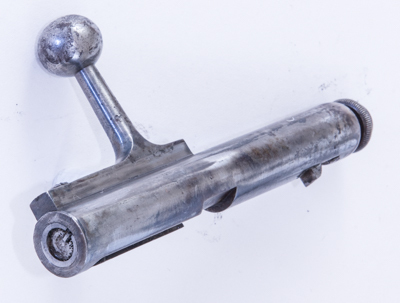 to accommodate the bolt handle's stem in its vertically closed position. Possibly "Manufacture d'Armes Damon et cie, St Etienne"
tight bore slugged at 0.221"
The disassembled parts image below illustrates a number of points. 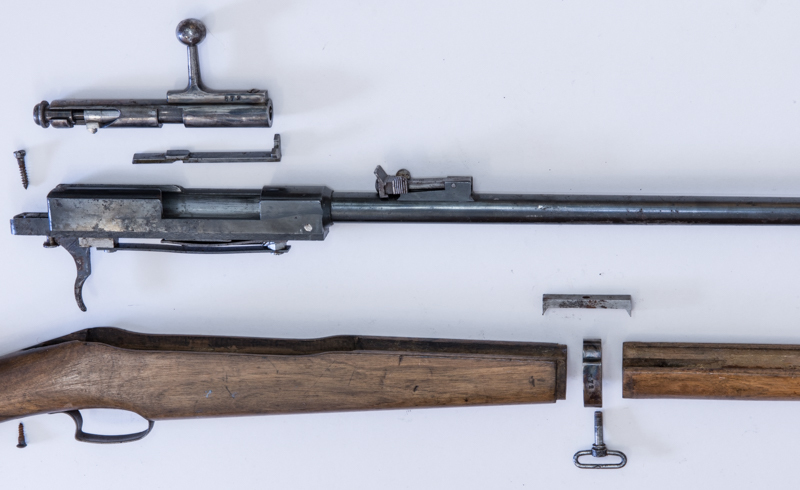 Firstly, apart from the external profile of the receiver and the bolt's cocking-piece arrangement, the remainder of the rifle is constructed with parts that appear, to all intents and purposes, identical with parts of the as yet unidentified Lebel-style training rifle on we show on another page. The rear-sight, with its windage adjustment, the barrel, barrel bands and fore-sight are certainly all from the same stable. One major difference, though, is the two-part fore-end wood, which has a steel linking piece with wedged lugs. 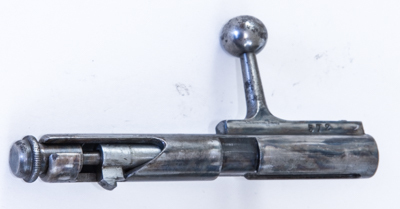 This part is let into the barrel-groove in the wood, and is drilled and threaded to take the combination bedding bolt/sling-swivel which, in common with the aforementioned Lebel trainer, does not fasten into the underside of the barrel, but does locate the rear barrel-band. with a third option of 5.5mm ' Extra-courte' (22in. Extra Short) chambering. The example above is marked ".22." on the barrel-LHS immediately behind the tangent rear-sight. Below is the rifle shown on a page from a 1951 catalogue. Offered are rifles chambered for the "Double Culot" (double base) 6mm 'Bosquette' cartridge, and for the .22"RF Lon Rifle cartridge. Theammunition was then priced at ?? francs per 250 rounds, and the rifle at ?? francs; this when 1 franc was aproximately the equivalent of ??p. Thus the rifle cost £?, and the ammunition about ?? new pence per round. "Manufacture d'Armes Damon et cie, St Etienne"
The action and rear-sight, viewed from above. The tangent rear-sight is calibrated 25-50-100-200 metres, and the elevation slide moves along a smooth ramp. The finely "U' notched rear plate is windage adjustable by slackening its clamping screw at rear centre. The barrel calibre mark of ".22." is just behind the rear-sight. The serial number is clearly stamped on the receiver ring "5572". The mark immediately above that is the French "BTE S.D.G.D. ", which abbreviates the French term "Bréveté - Sans Garantie Du Gouvernment", advising that the rifle carries no Government guarantee; an indication that it is not of military issue. Society of Miniature Rifle Clubs. Both the foresight and front barrel-band are of the same type as the previously mentioned unmarked Lebel-type training rifle. The band is simply attached with a screw underneath into the woodwork; thus the barrel is effectively the only means of support for the fore-end forward section. Those two cartridges recommended for the "Nationale Rifle" are the 6mm Flobert of the Bosquette system - with conical bullet - intended for ranges up to 25 metres, and the similar 6mm "Nationale" cartridge, also double-based and 'percussion annulaire' (rimfire) - with round-nosed bullet -for ranges up to 40 metres. The later .22RF Long-Rifle cartridge, had a stated maximum suitable range of 150 mtrs. Three images of the breech, muzzle and rifling are shown below. 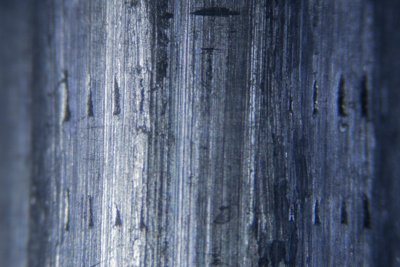 Below is an image of a lead slug - in the form of a .22 bullet - that has been passed through this barrel. where it is just possible to discern the original twin peripheral rows of indentations which held lubricant on the driving band.